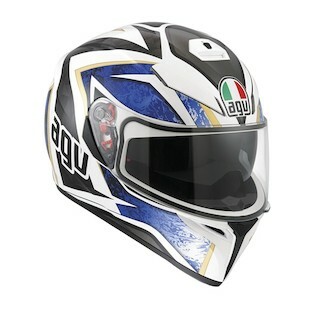 The AGV K3 SV is a great helmet. By incorporating many of the technologies found in their super-premium AGV Pista GP and AGV Corsa helmets, the helmet manufacturer has been able to offer an incredibly high level of functionality to a helmet that comes with a very reasonable price point. To add to the lineup of the K3 SV, AGV has released three graphics that add some pizzaz to the standard Black and White color options. 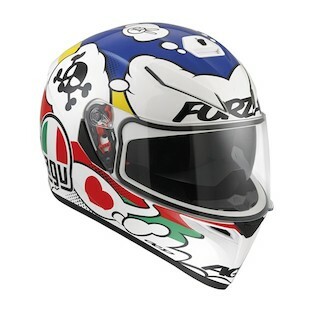 The AGV K3 SV Simoncelli Helmet is set as a replica of the helmet worn by Marco Simoncelli. 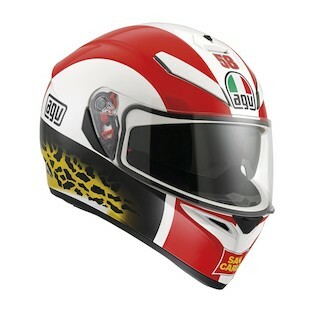 Simoncelli’s signature style is unmistakable in this leopard themed lid that pays tribute to the racer’s legacy. For all of his fans who want to rock his style, this is a helmet for you. For a playful side that still means business, the AGV K3 SV Comic Helmet is here to lighten up the doldrums that can result from yet another standard, solid helmet on the road. This is a helmet for riders who embrace the Italian energy as they zip around town. Filled with colors and action, the words “Mi Scusi” and “Grazie!! !” adorn the back to politely say “please get out of my way…. thank you”. Futuristic space age. That is how to describe the AGV K3 SV Vulcan Helmet. Any Star Trek fans will certainly see where this helmet got its design style as it showcases an angular graphic that looks as if it could have come from one of their interstellar ships’ gear closets. If you are looking for a lid that is high in quality, reasonably priced, rich in features, and steeped in style, check out one of the newest graphics from AGV and the K3 SV Helmet.